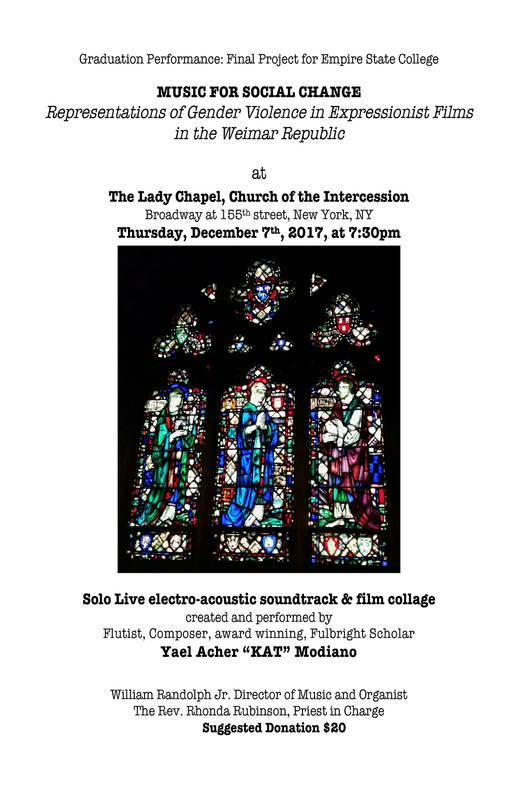 A Holiday Reading of Clement Clarke Moore's "A Visit From Saint Nicholas"
Intercession’s Choir, Baritone, Yun Kwan Yiu will sing the lead in this production on December 12-16. 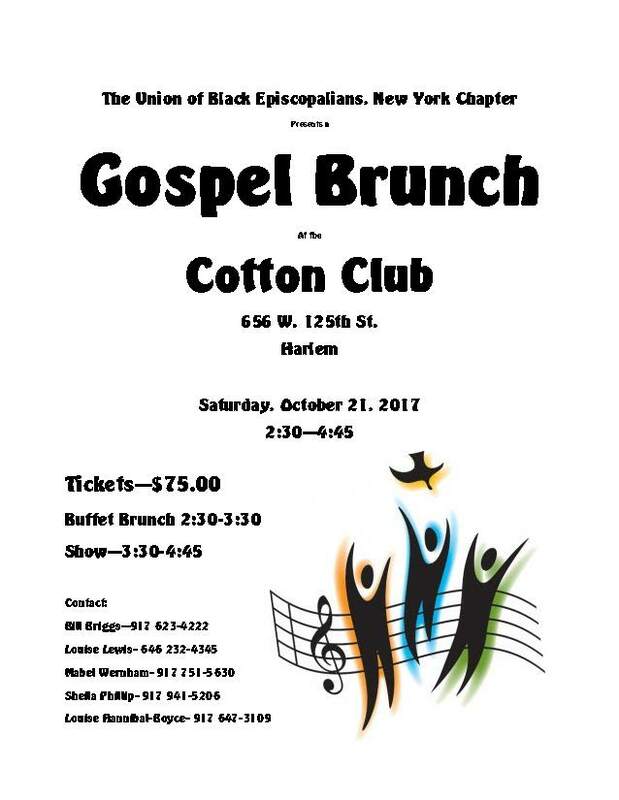 A 30th Precinct Crime Prevention Officer will be conducting a presentation and distributing senior safety bags. 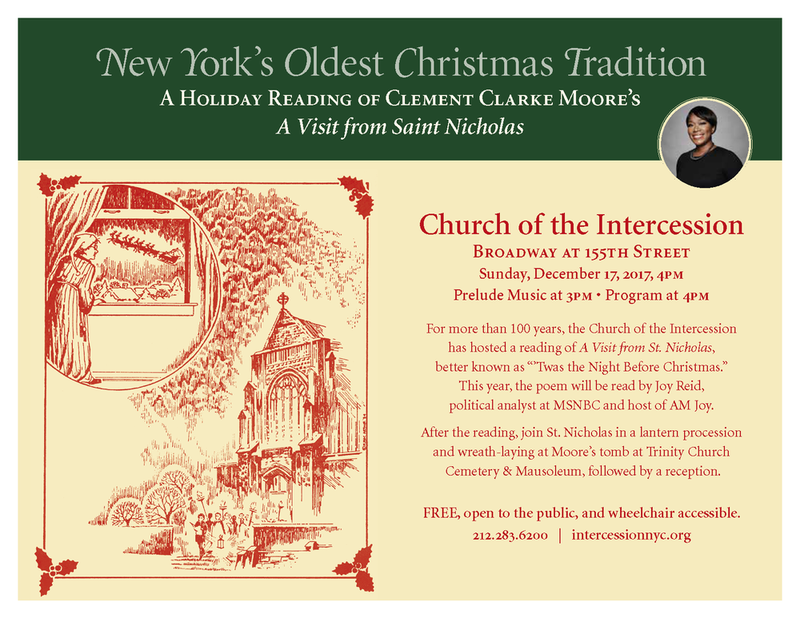 Friday, April 14th 10 a.m. to 3 p.m.
Saturday, April 15th 10:00 a.m. to 1 p.m.
Sunday, April 16th 8 a.m. to 3 p.m.
New York's Oldest Christmas Tradition: A Holiday Reading of the beloved Clement Clarke Moore Poem "A Visit From Saint Nicholas" with Sade Baderinwa. Following the reading, join St Nicholas in a lantern procession and wreath-laying at Moore's tomb at Trinity Church Cemetery & Mausoleum. What is Gobble Gobble Give? A large group of volunteers, armed with a prepared Thanksgiving dish and donations, gather at The Church of Intercession on Thanksgiving morning. At the church, volunteers create a large "conveyer belt" and build thousands of individual meals. While some volunteers are packing individual meals, others are sorting the donated canned foods, toiletries, clothing, toys & blankets. As meals and donations are packed up and ready for delivery, volunteers are deployed to locations throughout the city. These pre-determined locations are individual families; shelters, retirement communities, group homes & areas where homeless people congregate. Yes, every volunteer must register for a team/time slot. Each team's shift is 45 minutes. We limit the time each volunteer can work so that everyone gets a chance to help. If you want to deliver, please let us know what area(s) of the city you are willing to visit. If you want to drop off donations at the church, just let us know when to expect you.